When we last left our story, I was a melting in Charleston, SC like a pat of butter in a hot pan and people thought I was a celebrity. So not one…but hey…it was pretty freaking cool. After my unexpected and totally awesome greeting, my first gift of Edel, I did finally get that cool shower and changed my clothes. Then I headed back down to the hotel lobby to hang out, do some writing in my journal and stay cool. There was a Starbucks at the bottom left of the lobby stairs (SCORE!!) so I got the first of many sweet teas with lemon to be consumed over the weekend and got comfy on the couch. I spent the next hour journaling. As I hung out in the lobby, I had the great fortune to meet Angie, Mo and Jen. They were also attending Edel and they had read my blog. They expressed their condolences over Courtney’s passing. I can accept those now without crying. It’s a good thing. It’s progress for sure and I am grateful for it. As we chatted I ended up telling the story of Courtney’s last 24 hours. I have not written it here in this space. It will come soon. It’s easier to tell the story at the moment, so I did. So many miracles happened in such a short period of time. The end of Courtney’s life was as beautiful as the beginning. This was my second gift from Edel. The sharing of my sweet daughter. To be able to talk about Courtney and share such beautiful memories with so many who prayed us through each moment was such a delight for me. Courtney did not belong to me alone. She belonged to all who prayed for her and supported her as she fought the good fight. After sharing this beautiful intimate conversation with these three, I was greeted with skipping across the lobby, arms raised with laughter and squeals by the indomitable Haley Stewart. 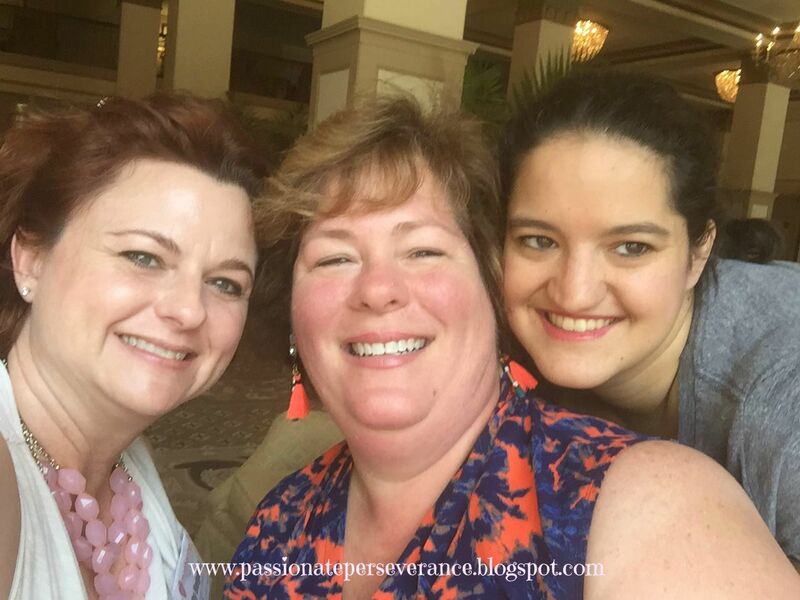 I have waited a long time to be able to meet some of my favorite on-line bloggers and I knew that this was going to be the weekend to make it happen. After thanking the fantastic trio, I excused myself and got the BEST hug from Haley. She radiates pure joy and it is contagious. Shortly after her arrival the fabulous Christy Isinger arrived all the way from Canada. These two co-host a podcast called “Fountains of Carrots” which I love. I also had the opportunity to meet Kathy Helgemo and a few other fabulous women. We chatted. We took selfies. Then we headed off to dinner. Hello humidity! It’s me Mary. Just wanted to let you know I had not forgotten you. As we walked a few blocks to the fabulous High Cotton restaurant, the sweat began to flow and I just gave in. I apologized to my dinner companions and just kept going. I was determined to squeeze every moment out of this weekend and sweat was not going to stop me. Our little group enjoyed a wonderful southern meal which included fried green tomatoes, a new personal favorite. We chatted for almost two hours and just had a blast. We also enjoyed a lovely little drink called the Charleston. Hello sweet tea vodka. It’s so nice to meet you. That meal represented the third gift of Edel. There were no strangers here. Everyone was open to meeting new people. It was actually the central focus of Hallie and Jen. To make sure no one felt alone. There were hugs and laughter all hours of the day and night. That night I headed to bed, after my third shower of the day, a very happy girl. I had already met so many wonderful women since landing in Charleston a mere twelve hours before. I had a hard time going to sleep I was so excited about what would come next. Friday proved to be INSANE. It all began with a hysterical chat in the lobby with Wendy and Kathy. I had just met these two women and yet I felt like they were lifelong friends. As we were chatting I received a text from Jen that she wanted me to be on her radio show that afternoon to talk about Courtney’s life and legacy. One minute I am laughing my bum off with my two new friends, the next I wanted to throw up and my hands were shaking at the thought of screwing up while on the air. This was NOT something I had ever considered doing. Who wants to listen to me? This was so surreal. Wendy and Kathy were laughing at my horrified expression and assured me I would be fine. We parted ways as I headed to the airport to pick up Kathryn who was coming in from Texas. She was on crutches after breaking her knee cap and I didn’t want her to have to ride in a cab. Friends are good that way. She enjoyed her very sweet ride back to the hotel and we parted ways for a short time. I headed up to the radio room to get ready for the broadcast. Get ready? Who am I kidding? My legs were shaking. My knees were knocking and my hands were a sweaty mess. I started talking to Courtney in my head asking for her intercession as I took a step off the cliff and entered a world I felt wholly unprepared for. The room we were in was about 100 million degrees (no joke, ask anyone) and add in my nerves I had no idea what was going to happen. I sat down put my headphones on and Jen started asking questions, I answered. I might possibly have forgotten for a moment that this was being broadcast nationwide. 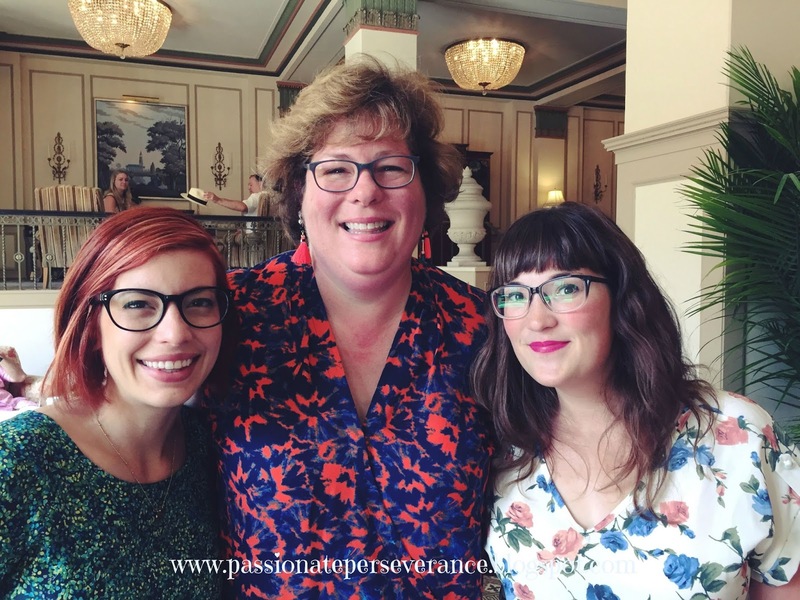 an amazing moment in my life – plus I got to meet Ginny in person!! I said “badass” on Catholic radio. Holy Cow y’all. Not my finest moment. At least I thought so until I was greeted by applause later for that very reason. I also shared that God doesn’t make mistakes. He gives us each exactly what we need when we need it. Our life with Courtney certainly proved that time and time again. It was an amazing moment in my life and not one I will soon forget. It also changed the course of my weekend. I had jumped of the edge of a cliff not knowing how/where I would land trusting God to make it all OK. He did. He really did. From that point on, Edel became a coming out party for me. It marked the official end of my formal grieving and the beginning of a new life. One where I honor my daughter and our journey together as I move forward into a new phase of life. Things are changing and that is terrifying and exhilarating all in the same breath. There will still be tears and deep valleys to walk through, but for now, it’s time to live and continue to listen to God’s still small voice guiding my every step. Tomorrow the final installment of my Edel journey. Part Three – where Mary sings karaoke off key and breaks her booty. Yes, there is video proof. What a great opportunity. And how funny that you said that on the radio. I grew up in a family where we thought the F word was fart. We were not allowed to say it. Anyway… I'm happy for you. I second (third?) that you are a celebrity to me! I was kinda quietly stalking you all weekend, looking for a time to get a hug, because I had seen you were a hugger 🙂 I'm glad you had a great weekend too! I'm loving your recaps and reliving your Edel weekend with you! So glad to have met you who I consider a celebrity too 🙂 So glad Edel was such a wonderful and life changing experience for you! I just love you, Mary. It was an absolute delight to meet and laugh with you in person! Thank you for sharing. It is so fun to hear! The day your husband posted the 'God must think I'm a bad a$$' I laughed out loud and shared it with my family. I don't think I qualify to attend Edel yet (unmarried, no kids), but golly. Everything I hear about it makes it sound so fabulous! "It marked the official end of my formal grieving and the beginning of a new life. One where I honor my daughter and our journey together as I move forward into a new phase of life." So very happy to read this Mary! Continued prayers as you move into this next phase!!!!! Wow, Mary, that's so beautiful how Edel helped you transition from grief into the next chapter of your life. 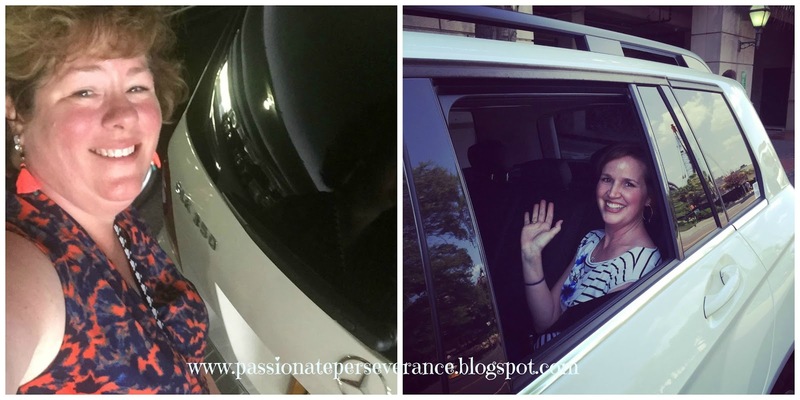 That's how God works, too…the most unexpected moments we never anticipated! So happy you had such a healing and refreshing time. I also can't wait until we can hear the beautiful story of Courtney's death. Of course you are both a celebrity and a badass! Thank you for sharing your journey. You and your family remain in my thoughts and prayers. wow! loved this post – you rock! I really enjoyed your recap. I loved the part about getting to tell Audrey Assad how much her music meant to you during your last days/weeks with Courtney. So very, very sweet.